"What a magical place! Loved our stay here. 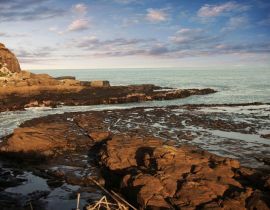 Stunning ..."
Slope Point - This short walk is only 2 minutes’ drive from our accommodationi. This is the most southern point of the South Island and now opens all year round. It is 7 km further south than Bluff. View the iconic photographed wind swept trees in the Catlin’s coastal area. Have a picture with the sign at to the equators. Waipahatui Reserve - 3 minutes’ drive from our accommodation. There are 2 walks to enjoy. The short walk is wheelchair accessible and takes about 20 minute through bush. The longer one is 3 hours which takes you into the heart of the forest to explore 2 spectator waterfalls. 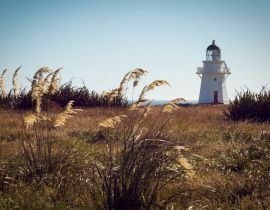 Waiapapa Point Lighthouse - 10 minutes’ drive from our accommodation. This is the site of New Zealand’s worst shipping disaster. The ship called the Tararua struck a reef in 1881 and 131 people lost their lives. Today it is inhabited by sea lions and coastal birds. 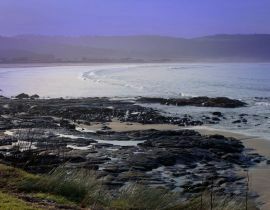 Curio Bay - 10 minutes’ drive from our accommodation. This is a great beach with lots to enjoy. There is a golden sand beach to walk or build sand castles in and hectors dolphins in the bay to watch or swim with between October and April (approx). 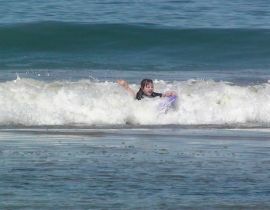 Body boarding, Surfing, fishing and relaxing to be had at Curio bay. Along from this is the 180 million year old Petrified Forest. This is one of the most extensive in the world and can be seen best 2 hours either side of low tide. Also, this is also where the yellow eyed penguins can be seen. Evenings are the best viewing time. Fortrose - 20 minutes’ drive from Slope Point Accommodation. Here you can see the ship wreck at low tide. Also Pukeko Alley has an art studio there. Also there is the Fortrose Estuary, Stirling Tides café and the cemetery to discover. Waikawa - 15 minutes’ drive from Slope Point Accommodation. This a fantastic museum that has numerous displays relating to the early settlers and their industries of this once bustling port town. Two short 20 minute walks (old coach road and George Aitken walks) are available along with the blue cod blues caravan cooking up great fish and chips. Niagara - 20 minutes’ drive from Slope Point Accommodation. The Niagara Falls Is a pun on the actual Niagara Falls. However the Niagara Café is another story. Serving great food and great hospitality, it is a great place to have a coffee and a meal. Arrive mid - late afternoon. 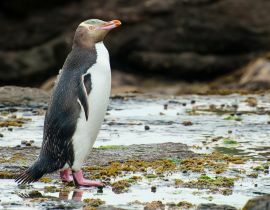 Travel to Curio Bay to see the penguins come in About 5:30 / 6 pm in summer. The next day - travel to Waipapa Point to the Light house then travel to Fortrose to discover the art gallery, ship wreck, cemetery and have a coffee at Stirling tides. Travel from there to Tokanui and refuel etc. Carry on to Niagara Falls and the Waikawa Museum. Have lunch at the blue cod blues or Niagara Café. 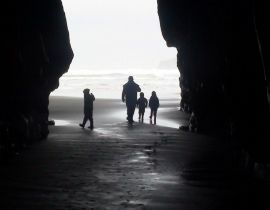 Travel around to Curio Bay and walk along the beach and drive up to the cliff tops. Check out the petrified forest in the light of day. Head back towards Slope Point and stop in for a walk to the waterfalls. Come back for a meal here then either relax or take a short drive to watch the sun go down at Slope Point. Please feel free to contact us directly about any questions about planning your holiday through this nature’s paradise. McLean Falls and Cathedral Caves - about 45 minutes away has walks please look at the “walks” section for more information. Purakanui Falls - These dramatic tiered falls are among New Zealand’s most photographed. A short bushwalk leads to the falls, and there viewing platform at the base. Nugget Point - This windswept peninsula with its historic lighthouse (dating back to the 1870) is home to southern fur seals, native sea lions and occasionally elephant seals. There are also numerous sea sea birds and a great view. 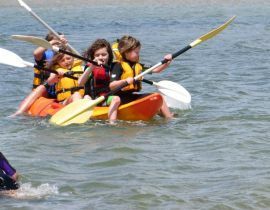 Other activities include surf lessons, Catlin’s Gallery, Catlin’s wildlife trackers, house riding, penguin tours, adventure tours, fishing and cycle trials. The list goes on. As you can probably tell, there is so much to do in a small area. This is a great place to discover unique walks, wild life, and history. Come and discover untouched nature in all its glory. © Copyright 2019. Slope Point Accommodation.